Roy Murray-Prior is Principal Consultant with Agribusiness Research, Development and Extension Services, which he established in 2013 and is based in Yungaburra, Far North Queensland. 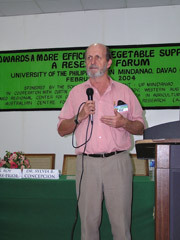 Roy is a highly experienced international and national researcher who can use and facilitate collaboration to integrate soft systems, quantitative modeling and experimental research methodologies to investigate problems ranging at the agribusiness and farming systems scale for a broad range of industries. Can also design, help implement and evaluate development and extension programs to communicate the key messages from research and build the human and social capital to enhance economic, social and environmental outcomes. He has recently been involved in research, development and extension projects in Bangladesh, India, Indonesia, Laos, Mozambique, Nigeria, Nepal, Philippines, PNG and Far North Queensland. He remains an University Associate of the Curtin Business School and is an Adjunct Professor in the School of Management with the University of the Philippines Mindanao. He is also Editor of the Rural Extension and Innovation Systems journal published by the Australasia-Pacific Extension Network (APEN) and is the APEN representative to the Global Forum for Rural Advisory Services. At Curtin University, Roy was an Associate Professor in Farm Management and Agricultural Extension in the School of Management based at the Muresk Campus in rural WA. He was involved in research and development projects in the Philippines, Indonesia, Timor Lesté, Papua New Guinea and South Africa, as well as WA and Qld. His research interests were in the application of pluralistic soft and hard systems approaches to research and development of agribusiness systems, farming systems, management decision making, adoption and rural development. Before going to WA, he worked in NSW, USA, and the South Pacific (lecturing in agricultural extension, initially as an Australian Volunteer Abroad) and Tasmania (as an extension officer). Understanding farm-household management decision making for increased productivity in the Eastern Gangetic Plains. Researcher consultancy with UWA for ACIAR, 2018-21. Sustainable & resilient farming systems intensification in the Eastern Gangetic Plains, ACIAR, 2014-18. Scaling out extension 2018-19. Regional Extension Plan for Cape York & the Wet Tropics NRM. Consultancy to assist Cape York & Wet Tropics NRM. 2018. Conducted research & extension activities & projects in Bangladesh, India, Indonesia, Laos, Mozambique, Nigeria, Nepal, Philippines, Timor Lesté, Papua New Guinea, South Africa, Samoa, Fiji, Vanuatu, Tonga & USA. Analysis & design of sustainable farming & agribusiness systems & value chains using integrated multi-methodologies of behavioural science. Design & evaluate rural development, adult-education & extension programs at local & national levels. Multi-methodology analysis of farming systems, management, decision making & adoption. Design & facilitate agricultural extension activities, projects & programs. Design & conduct evaluation of agricultural extension activities, projects & programs. Act as a collaboration facilitator and knowledge entrepreneur. Team leader for Baseline studies for IFC Agribusiness PNG programs on coffee, cocoa & fresh food industries - 2013 to present. Team leader for ‘Evaluation of PNG Coffee Industry Corporation extension service’ for World Bank - 2013. Research Coordinator, Muresk Institute, executed strategic planning contributing to lifting research & postgraduate profile from bottom to top of Curtin University performance indices. Team leader for 'Improving the efficiency of the agribusiness supply chain & quality management for small agricultural producers in Mindanao' - ACIAR $357,000; 2001-04. Team leader for Evaluation of beneficial end uses of mine lakes' project - Centre for Sustainable Mine Lakes Project - $83,000; 2003-06. Established Extension Farming Systems Journal in 2005 & since as Editor published 9 issues. Publications: 191 - journal articles 46, book chapters 6, refereed conference papers 12, published conference papers 45, other 81. PhD, U. New England, NSW, Australia. Modelling decisions of wool producers: Hierarchical decision models & personal construct theory. MSc, (Ag Econ) Cornell U., NY, USA. Management strategies for improving profitability of average resource dairy farms in New York State. BRurSc (Hons), U. New England, NSW, Australia. Some physiological & behavioural aspects of fertility in mice. PGDipAgExt, U. Melbourne, Vic, Australia. An exploratory assessment of the Tasmanian Journal of Agriculture.